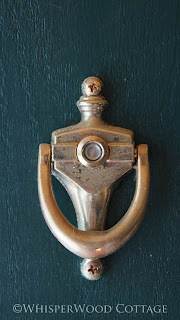 WhisperWood Cottage: Front Door Makeover...Olive is in the House! 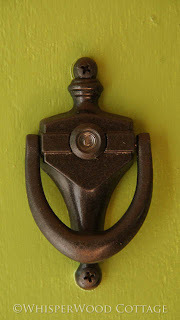 Front Door Makeover...Olive is in the House! How do you like my wack-a-doodle crazy color on the front door? I don't know what's going on with me lately. Definitely feeling more adventurous and loving it! 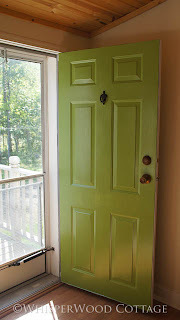 First a tufted faux fur ottoman and now an olive colored door? Such a rebel I am! The door color was inspired by the olive colored pillows I found last spring at TJMaxx. Believe it or not, the paint chip matched the pillows perfectly. It turned out a bit brighter than I expected...probably due to the reflection of the sunlight on the door. The door definitely has a fresher feel to it. The peephole got a new color, too...digging it! The door looks a bit more yellow than it actually is in this photo. The sun was shining brightly! It's beautiful, I'm a little jealous! I love it. 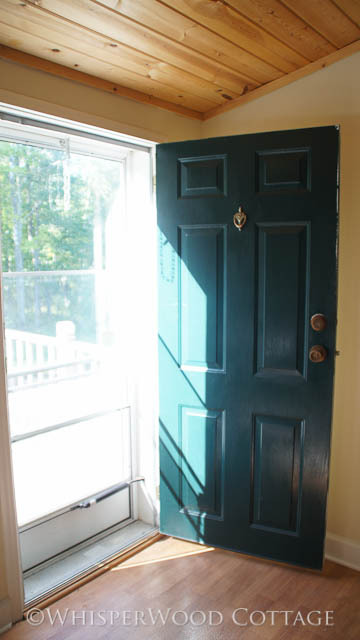 You are definitely walking on the wild side, but what better way to do that than in a front door colour. It will look fantastic at Christmas too (always an important consideration for me in selecting my door colour). I love the new color ... it's vibrant but really classy. It looks amazing. Looks like an uplifting spring color. 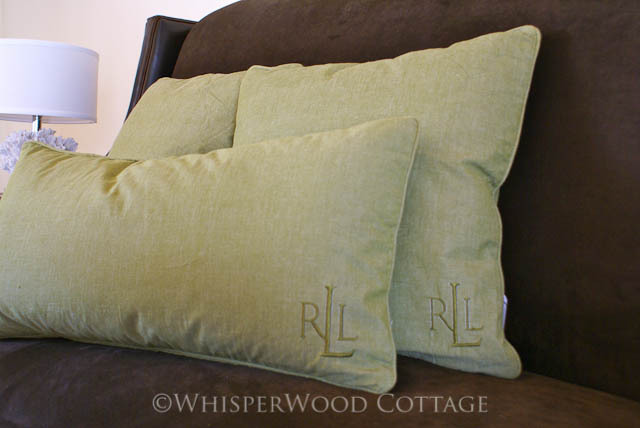 And don't we all need a little boost of spring green over the long winter! It will look stylish with a red-bowed Christmas wreath. I like the rebel in you. I wish I could find a bit of that in me. I've been wanting to paint our doors and narrowed it down to 3 sort of safe colors and can't even commit to one of those! Very fresh and certainly not predictable. Love it and I agree that it will look great at Christmas, fresh and modern for Spring, but still work the rest of the year. You can't beat a colour from nature. Very fresh, but also versatile.